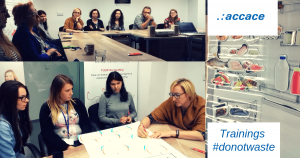 This month the Accace Poland team has participated on a very interesting workshop on food waste, organized by their current CSR partner Bank of Food SOS Foundation (BZ SOS in Warsaw). The aim of the workshop was to be more conscious about everyday bad or good habits related to food. How to stop food wasting? What type of food we waste the most often? How much money we lose during a year if we waste food or don’t organize our everyday life better? What is the amount if we are not preparing a list of food, thinking about menu before the visit of a supermarket, not sharing food, not segregating properly? Every year people waste 1 billion of food all over the world. 1 tonne of food means 4,2 tonne of Co2 emission to the atmosphere. 1 cheese sandwich equals 90 l of water needed for production – which is the amount of water for a full bath tube. In Poland an average person is wasting approximately 250 kg of food per year. Just in our households it means the 53% of our garbage. The workshop also revealed the champions of not wasting food – less than 100 g of food per week, while the number is 1000 g per week for an average person. Finally, they calculated how much money they are losing every year the food they don’t consume. The results were very surprising for some of our colleagues: from 75 EUR to 1 500 EUR per year. That could be a wonderful holiday in some tropical country or anywhere else! REMEMBER – tomato, cucumber, zucchini, some fruits to keep out of fridge. Put your food properly in a fridge, (you can find an example on our photo). ALWAYS PLAN – before shopping, always check what you have at home, then plan the breakfast, dinner, supper with those products and make a list what is missing. THEN BUY. If you have too much – SHARE with friends, neighbours, colleagues.